Perfect daylight temperature for professional images. 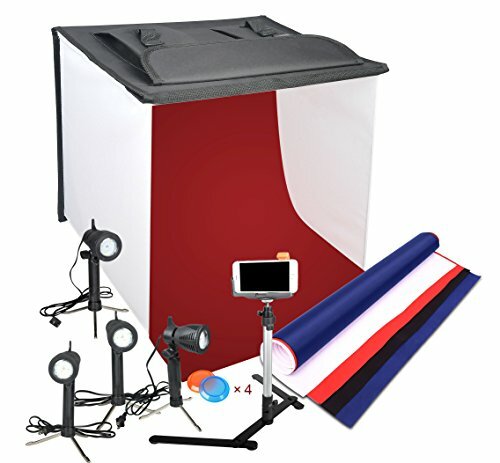 For toy, baking, jewelry, etc photography and still photos.The background cloth will not wrinkle.And the lamp legs are easier to take out. After opening the cover, the lamp legs will automatically pop out a part, take out and collect the lamp legs easily. The case is part of the light box, which makes setup and subsequent pack up a breeze. Easy to set up, folds up with pockets to store the lamps. High Output Table Top Photography LED Light Stand: The lights do not get hot, well constructed, and can be positioned easily without falling over or moving. The Red & Blue Gel Filter can Change the Kelvin Temperature.